For the second iteration of the mental health art exhibit, Stories Untold, some artists turned to traditional mediums — canvas, paper and audio — while others took more unorthodox routes. 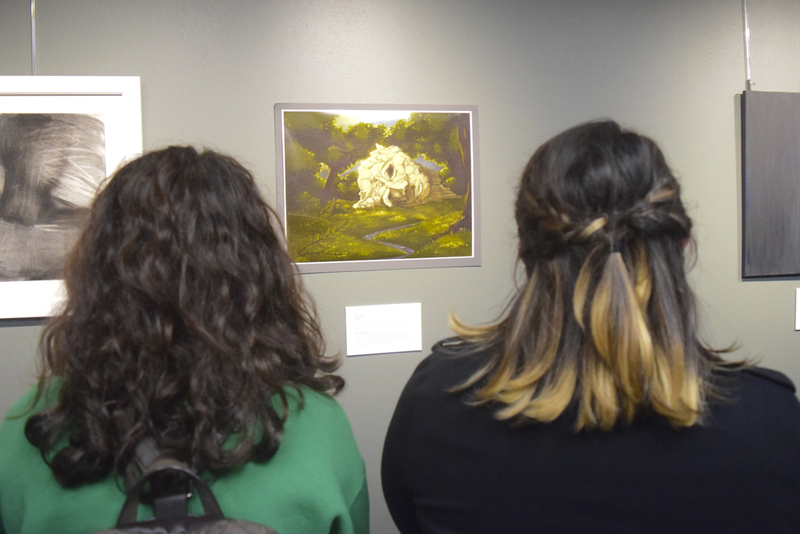 To kick off Pitt’s Mental Health Awareness week, about 50 students, artists and community members gathered for Stories Untold’s opening reception from 8 to 10 p.m. Monday night in William Pitt Union’s Conney M. Kimbo Art Gallery. The attendees munched on healthy brain food and drinks, including a salmon and quinoa dish, while scoping out the artists’ work. The Pitt Program Council organized the space for the gallery along with the exhibit’s curator, Abigail Wang. PPC also partnered with several other campus organizations to present Stories Untold, including Pitt Active Minds and the University Honors College. Poems written by Jessica Keller, a chemistry major and biology and psychology minor from Chatham University, hung on a wall in the center of the room. Each piece of writing centered on her own experience with mental illness. Keller’s writing in the exhibit focuses on the parallels between stress in real life and stress in the classroom. She also incorporates her scientific knowledge about mental health and explains how being around others with mental illnesses — people prone to “falling into darkness,” as she calls them — can be uplifting as well as disheartening. Keller said an exhibit like Stories Untold can help spark conversation on issues that are generally difficult to talk about. “On its own, college is very stressful and anxiety-inducing, so if you’re somebody who is already prone to those things, it’s that much worse and people aren’t always sympathetic about it,” she said. The search for artists like Keller began in the summer before the fall semester, according to Wang. The search produced a litany of submissions and potential artists, and Wang said virtually no one was turned away. The purpose of Stories Untold, according to Wang, is to include both those who have experienced mental illnesses and those who don’t have prior understanding of mental health. “We’re not very picky so we don’t really cut anyone because it’s people’s experiences, so we want them to have the freedom and space to share it,” Wang said. She added that by allowing people to use creative expression in the recovery process, the exhibit opens up avenues for conversation and empathy. Additionally, Wang wanted to make the space for the exhibit more open than last year’s showings by including more pieces of art that could hang on the walls, as opposed to sculptures in the center. Senior Rohit Maudgal’s piece, “Gaze,” a graphite drawing based on a photograph of a young woman staring intensely at the viewer, explicitly connects the subject of the art and the viewer. According to Maudgal, the eye contact allows the viewer to understand the introspection and personal development that comes with discovering ourselves. Maudgal began drawing at a young age and after seeing a flyer advertising Stories Untold, he decided to create a piece specifically for the event. Janelle Maloch, a postdoctoral associate at the Student Affairs Counseling Center, said art provides an outlet that people might not have in their lives otherwise. Maloch spoke about the value of art therapy before the gallery’s opening.